Dorothy L. Hueste, age 77 of Loose Creek, passed away Tuesday, January 15, 2019, at Capital Region Medical Center in Jefferson City. Dorothy was born September 4, 1941, in St. Louis, a daughter to the late Charles and Loretta (Gregerson) Samson. Dorothy was a 1959 graduate of Linn High School and also attended Capital Business College in Jefferson City. On June 3, 1961, she was united in marriage to Charles Hueste at St. George Catholic Church in Linn. He survives of the home. Dorothy was a homemaker and also worked at the Unterrified Democrat as a typeset operator and then at the Osage County Abstract Office until her retirement in 2005. She was a member of St. George Catholic Church, Ladies Sodality, the Red Hat Society, Osage County Historical Society, and served as a 4-H leader when her children were young. Dorothy enjoyed gardening, playing cards, dominos, bingo, fishing, traveling, shopping and spending time with her family. 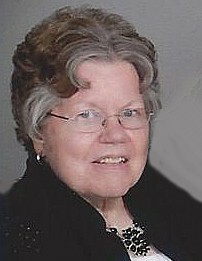 In addition to her spouse of 57 years, Dorothy is survived by: two sons, Gregory Hueste and his wife Kathy of Camdenton and Christopher Hueste and his wife Mary Beth of College Station, Texas; one daughter, Cathy Jo McCuskey and her fiance Tom Roark of Linn; eight grandchildren, Jacob, Johnathon, Alexandra, Michael, Anastasia, Chelsea, Kristin, and Jimmy; five great grandchildren, Addisyn, Kynlee, Mylee, Paisley, William along with one great grandchild due in April; two nieces, Penny Kentch of Warrensburg and Pat Smith of Holts Summit; a brother-in-law, Clifford Wolfe of Bonnots Mill and many cousins, great nieces and great nephews. In addition to her parents she was preceded in death by one sister, Mary Ann Wolfe. Visitation will be held from 10:00 a.m. to Noon on Monday, January 21, 2019, at Morton Chapel in Linn. Mass of Christian Burial will follow at St. George Catholic Church in Linn with Fr. Daniel Merz as the Celebrant. Interment will be in the St. George Parish Cemetery. Expressions of sympathy may be made to St. George Capital Campaign Fund.